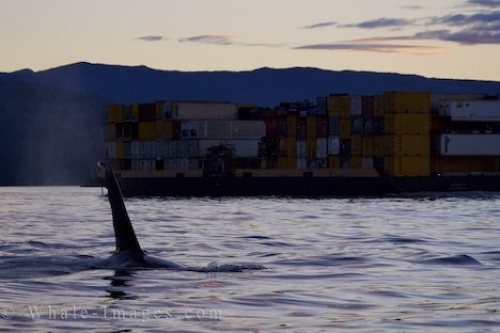 A barge carrying a full load off Northern Vancouver Island in British Columbia, Canada as a lone male Orca passes by. The waterways off Northern Vancouver Island in British Columbia, Canada are fairly busy, but this lone male Orca does not seem to bothered by this barge passing by. A fully loaded barge is a common sight in these waters, as well as cruise ships, fishing vessels, whale watching tours, canoes and kayakers. The Northern Resident Killer Whales that visit these waters on an annual basis are very familiar with the loud noises of a barge, but it is when there is carelessness by humans that problems occur. This Killer Whale still continues on his way and enjoys the quieter hours at sunset in these waters as most of the daily boats have begun to head back to their home base for the evening. Every day off Northern Vancouver Island in British Columbia, Canada is a different day for an Orca especially in the months between June and October. This is prime whale watching season as well as the busiest time of the year for other ocean going vessels. If you are out on the waters off Northern Vancouver Island, pay close attention to any Killer Whales in the area and abide by the guidelines. These guidelines are very important so that there is no harm done to the Northern Resident Killer Whale population and we will be able to have years of viewing these fascinating mammals in their natural environment.